When Jeff retired after 30 years in law enforcement, he was not done working or serving others. He decided to combine his lifelong passion for hunting, fishing and the outdoors with his knowledge of the land and real estate. It turns out recreational real estate was a perfect fit. Near the end of his career as a police officer, Jeff worked as a recreational leasing agent evaluating land providing hunters with leases throughout the state of Michigan. He helped many happy clients, both landowners and hunters, with their hunting land in over 50 counties. It wasn't long until those clients were asking him to help them buy and sell their property. Jeff understands that landownership can be a big step and feel a bit overwhelming. He also understands it can be an emotional decision when it comes time to let go of that special place. Whether you are seaching for that place to call your own or ready to sell a quality property, he looks forward to making it a smooth and enjoyable experience for you. The same values he applied in law enforcement he continues to apply in real estate, providing an honest property assessment and protecting his clients' interests. 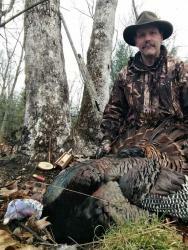 Jeff has hunted deer, turkeys, grouse, woodcock, pheasants, ducks, geese, and rabbits throughout Michigan from the western edge of the UP to the southern border. He is often torn between his two greatest passions, sitting in the deer stand or chasing grouse with his dog Gipper. Jeff lives in West Michigan with his wife Jane. They have five children. He is happy to discuss your real estate needs and is looking forward to meeting you.